Munich - Following a goal-filled weekend of action in the Bundesliga which proved too prolific even for Real Madrid coach Jose Mourinho to take for a full 90 minutes, we asked you to vote for Matchday 29's standout performer. Six nominees comprised our post-Matchday poll and the votes flooded in from Bundesliga fanatics the world over, with one surprise winner. FC Schalke 04's secret weapon Teemu Pukki took the spoils with a staggering 60 per cent of the vote following his game-changing performance against Bayer 04 Leverkusen on Saturday evening. The Finland international made his mark within five minutes of his second-half introduction, before winning the match-levelling spot-kick, swept home by Raffael with four minutes remaining to complete the most improbable of comebacks. Our silver gilt medal goes to Hamburger SV's Heung Min Son, whose two goals ensured the northern club remain firmly in contention for a place in next season's UEFA Europa League after victory at Mainz. The South Korea international again proved his worth, taking his tally to 11 Bundesliga goals this season. Not only that, but an impressive 83.3 per cent of his 12 attempted passes found their mark in a hard-fought contest in which Son covered an exhausting 11.3 kilometres. 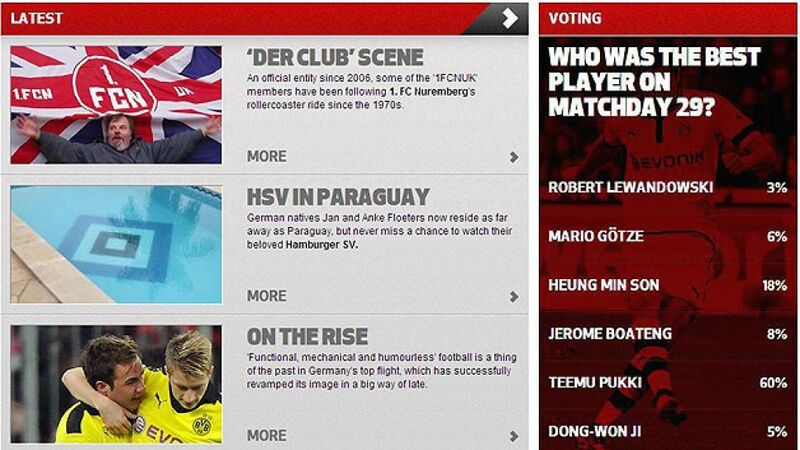 That brings us to the battle for the bronze, with just a handful of votes edging FC Bayern Munich acrobat Jerome Boateng (eight per cent) out in front of an all-star chasing pack made up of Mario Götze (six per cent), Dong-Won Ji (five per cent) and Borussia Dortmund goal machine Robert Lewandowski (three per cent). All four contenders found the net at the weekend, but none so in quite as spectacular fashion as Boateng. The centre-back's stunning scissor-kick set the tone for another memorable afternoon for the champions, who made it a record 25 wins for the season with a 4-0 drubbing of 1.FC Nuremberg. Don't forget to check out our Fanzone page this coming weekend to have your say on the top performers of Matchday 30.